What a year! I've done more than I would have thought it possible to fit into a year. Personal highlights included teaming up with Manchester Modernist Society and the Loiterers Resistance Movement for the Manchester's Modernist Heroines project, organising the first Victoria Baths Fanzine Convention (although, at the time, it was so stressful it made me half-lose my hearing for a week!) and being invited on the Under the Pavement radio show on Levenshulme's All FM to talk about the fanzine convention. 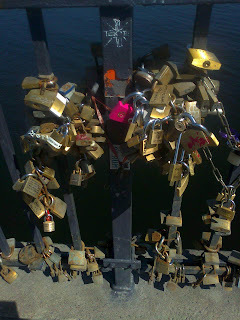 I visited for the first time a number of places I'd long wanted to go to – Bradford, Saltaire, Holmfirth, Bournville, New Mills, Helsinki, Lyon and, my new favourite city, Stockholm. I went to Wythenshawe Park for the first time, and also visited Modernist Heroine Mitzi Cunliffe's epic, monumental public artwork on the Heaton Park pumping station (photos can't prepare you for its scale!). I plunged into the (ice cold) sea on the Kent coast over an unseasonally warm easter and swam in three lidos for the first time, ranging from warm – Hathersage lido in the Peak District on a rainy day (heated), to refreshing – the massive Tooting Bec lido, an escape from the London stickiness (unheated), to freezing – glamorous, art deco Saltdean lido in East Sussex (definitely unheated!). The Shrieking Violet went a bit interview crazy in 2011, and I did my first ever Skype interview with Ancoats Peeps artist Dan Dubowitz, who is now based in Italy. Favourites included Carol Batton, David Medalla, Maurice Carlin, Dan Dubowitz and Anthony Hall. Overall, 2011 has been a particularly good year for film and art, and I dramatically increased my TV viewing in 2011 (it was a great year for documentaries! ), but unfortunately I've not been listened to as much new music or been to anywhere near as many gigs as I should have done (I am never missing a Thermals gig again – not going to see them at the Roadhouse was one of my big regrets of 2011!). A magical installation on the top floor of Islington Mill, MacMurray filled the loft, accessed via a rickety wooden staircase, with a mass of white feathers which change colour as the light floods in, surrounded by big windows looking out over Manchester and Salford. A small show, but one which transformed the gallery space with his trademark stripes, incorporating multi-coloured perspex that caught the light. One of the funnest bands I've seen in ages, Argentinian group Las Kellies are a dance-punk-party band, complete with bright coloured floral dress, sunglasses and an ESG cover. 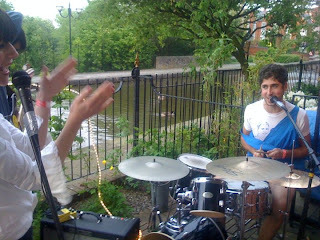 A bank holiday Friday garden gig next to the canal, Birmingham's finest Ace Bushy Striptease blasted away any thoughts of the royal wedding – and attracted a pair of fighting geese – before indie-folk duo the Middle Ones calmed things down with an intimate acoustic set. One of my favourite bands playing one of my favourite ever albums in its entirety – plus some solo, more country songs from Evan Dando. I wasn't planning to go and see David Thomas Broughton because I'd already seen him so many times, but slipped into Peel Hall during a quiet moment at Sounds from the other City and remembered that, live, David Thomas Broughton's extraordinary voice and stage presence is never less than captivating. A classical concert that felt closer to a rock concert. Pieces from Reich's long career were performed by young musicians, with an appearance from the composer himself on 'Clapping Music'. Chaotic but brilliant, Californian power-pop band Flamin' Groovies staggered through a set of rock 'n' roll and surf influenced punk classics. Singer Chris Wilson, who was clinging onto the microphone stand throughout, only fell over once. The highlight of the launch of Hiss Heads, Florian Fusco's zine about Manchester's analogue aficionados, was a solo set from Pascal of Part Wild Horses Mane on Both Sides in the project space at Rogue Studios in Crusader Mill in Ancoats. I haven't been so excited about a Manchester band in years. A boyfriend-girlfriend duo comprising Nick from Beach Fuzz and Kate from Hotpants Romance (one of my favourite Manchester bands), they make great pop songs with a raw, rattling punk sound driven by Kate's Mo Tucker-esque drums, bringing to mind Vaselines, early Pavement and the one hit wonders of Nuggets boxset. Park Hill's been in the news a lot this year, but by far the best take on Urban Splash's controversial 'renovation' was a short, thoughtful and near-heartbreaking Radio 4 documentary which went in search of the people behind the famous 'I love you will you marry me' graffiti on one the the building's raised walkways, recently highlighted in neon by the developers. Artist Andrew Shoben came up with a great premise for a radio show – retiring out of date works of public art – that was funny, thought-provoking and at times frustrating but always highly listenable and entertaining. There were several series I really, really enjoyed this year. The year got off to a good start with the return of my favourite TV show, Michael Portillo's Great British Railway Journeys (whatever you feel about the man's politics, he's an amiable TV presenter with infectious enthusiasm). Melvyn Bragg's Reel History of Britain was a good idea, but I found it disappointingly patchy (Bragg's wooden presenting style doesn't help, although programmes on early documentary films about slum housing, and the origins of the National Health Service, were good). Jamie's Dream School was an interesting, thought-provoking concept for prime time TV, but I felt the scale and complexity of the project was too great to be represented in the narrow slots of the TV format. Ceramics: A Fragile History, about the Stoke-on-Trent pottery industry, had its moments, and made me want to explore Stoke-on-Trent, but my TV highlights were a series on Pathe newsreels and Julia Bradbury's Canal Walks, which followed an excitable Bradbury as she tramped across the country along its networks of canals. The star of 2011's TV for me was Tom Dyckhoff, who fronted a short series called the Secret History of Buildings, a highly watchable and accessible look at how the built environment around us affects how we live, work and play. I would watch TV far more often if Tom Dyckhoff presented more of it! A dreamy look at watery outdoor pursuits around the country. A timely look at the origins of social housing and what went wrong. Everything about this programme about the campaigners who rescued our inland waterways from dereliction was perfect, from the excerpts of archive footage and range of interviewees to the music and the warm autumn colours it was filmed in. An intelligent look at the history and spread of unwanted plants, taking in science, control and cultivation, with a welcome appearance from Richard Mabey. As a social realism devotee, whose feelings towards animals are ambivalent at best, an animated film about a dog is the last film I would expect to be my favourite of a year. My Dog Tulip is warm, funny and beautifully drawn, plus you get to see the best bits of owning a dog – companionship and exercise - without the drawbacks – smells, mess and bodily fluids. Gillian Wearing's film is one of the most involving and absorbing, if at times uncomfortably personal and confessional, films I've seen. Whilst Pedro Almodovar's The Skin I Live In was a slick, stylish, welcome return, Biutiful was the best Spanish film I saw this year, containing the grit and emotional impact lacking from Almodovar's film. Javier Badem's stunning performance almost made you feel sorry for his shady character. Manchester Modernist Society screened this documentary about the vision, idealism and buildings of the generation of post-war architects, which took many of the architects, now in their eighties but still full of attitude, back to see their creations. The red hooded jacket unsettled me a bit, reminding me of Don't Look Now, but Submarine is indie filmmaking at its best – despite their flaws, a film where you can empathise with the characters rather than wanting to hit them. Manchester's galleries were immersed in all things Kurt Schwitters during the Merz Man festival, a Greater Manchester-wide celebration of Kurt Schwitters, which included talks, exhibitions and events related to the artist, his work and his influence (some more tenuously than others). Highlights included experimental dance teacher Valerie Preston-Dunlop's nostalgic walk up Oxford Road, reminiscing about her days studying under teacher Rudolf Laban, and subsequent talk at the Royal Northern College of Music, facilitated by Manchester Modernist Society. 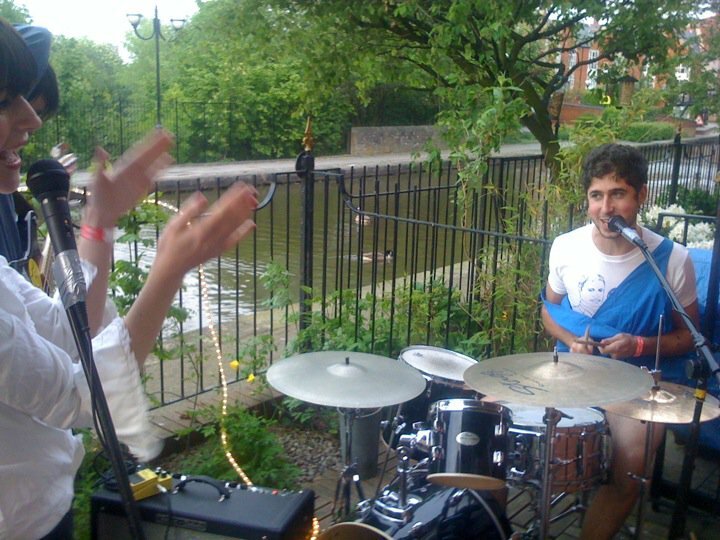 For the first half of 2011, Thursday evenings settled into a routine of diverse and inspiring talks at Islington Mill, by artists, curators and other people involved in the art world. An inspired idea for an outing, Manchester Modernist Society and the north west branch of the Twentieth Century Society organised a coach trip visiting Greater Manchester public artworks from the 1960s and 1970s by Alan Boyson, from ceramic tiles on a shop in Denton to a mural outside a pub in Collyhurst to a listed mosaic on a wall in Salford, the only part of a demolished school still standing. My personal favourite was an etched perspex window in St Ann's church, which touched the vicar in a way he couldn't quite explain. One of the best productions I've seen at the Royal Exchange, a powerful rendition of Arthur Miller's play with minutely observed 1930s period detail. Freedom Studios' eerie, evocative promenade theatre performance round the empty textile mill, meeting the ghosts of its workers as production gradually shuts down. Issue 3 of Manchester Modernist Society's magazine the modernist, themed Boom or Bust, is out now, just in time for Christmas. I've been loose with this issue's theme and used it as an appreciation of some of my favourite, underrated 1960s films: Charlie Bubbles (written by Shelagh Delaney, directed by and starring Albert Finney and featuring Liza Minelli), The White Bus (written by Shelagh Delaney and directed by Lindsay Anderson), Mrs Brown, You'e Got a Lovely Daughter, a comedy musical starring the pop group Herman's Hermits, A Kind of Loving, and The London Nobody Knows (starring James Mason). Whilst some of the films are seemingly slight or frivolous, all share a preoccupation with the new housing projects and changing types of living that were replacing bomb damaged cities and Victorian slums, capturing a sense of optimism and hope for the future that we now know was short lived. Mrs Brown, You've Got A Lovely Daughter might come across as slightly cheesy, but I've watched it twice and find it genuinely charming. I found myself singing It's Nice to be Out in the Morning every day when I left the house for weeks afterwards! If you're interested in finding out more about Manchester and Salford on screen, look out for historian CP Lee's talks which take place at the Cornerhouse from time to time, as well as his Hollywood of the North Coach Trip, or visit his sites It's A Hotun and Manchester Film History. the modernist issue 3 also features an introduction from Shrieking Violet inspiration Owen Hatherley, as well as Eddy Rhead on TV broadcasting from the north, Matthew Whitfield on Liverpool's Brutalist sandcastle, Dan Russell on Liverpool International Garden Festival, Aidan Turner-Bishop on Hornsea Pottery, Morag Rose on Modernist Essex, Benjamin Tallis on Leningrad, Stephen Hale on FIAT's Lingotto factory, Christien Garcia on Canadian Modernism, and news and reviews. 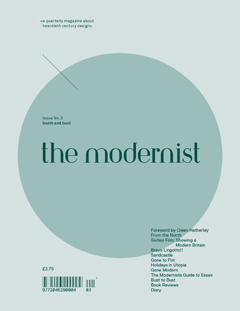 For stockists or to subscribe visit www.the-modernist-mag.co.uk. FEAST is a new food and art journal initiated by Manchester-based curator and writer Laura Mansfield. Issue 1 is out now, themed Indulgence, featuring everything from recipes to an essay on food and film. The latest edition of annual arts journal Corridor 8, which assumes a different form each year, is out now. Issue 3 is divided into three editions, the first of which focuses on commercial galleries across the north of England, containing interviews with their directors on their motivations and the challenges and advantages of operating outside London. Canning is a beautifully designed and illustrated fanzine about the area of Liverpool by writer Kenn Taylor, artist Natalie Hughes and designer Mike Carney that combines creative writing with personal observations on place. Kenn Taylor has also recently written a more in depth book about another part of Liverpool, entitled A Brief History of Edge Hill, as part of the Metal Culture project in the city, designed by Ultimate Holding Company. COPY is a publication compiled by Yorkshire-based Critical Writing Collective. The current issue, titled Unfold, features a contribution by Manchester-based artist Daniel Fogarty. 'In Public' is a photo of a small belemnite fossil embedded in the polished stone of a basin in the toilets of the Bridgewater Hall. Due to certain obstacles (the fossil being in the ladies' toilets), I was asked to take the photograph. During a recent visit to London I bought a copy of art and culture magazine Garageland, which is published by east London's Transition Gallery. The current issue plays with the theme 'Fake'. Highlights include articles on the south Kent coast's 'pluto' houses and the craze for mock Tudor. I also really enjoyed spending a couple of hours browsing the Archizines exhibition at the Architectural Association in Bloomsbury, featuring architecture zines from all over the world, including the modernist and Preston is my Paris. Other highlights included Block and Matzine from the UK, and a zine which photographed street furniture and public art across Latin America. This sloe gin started life in late-summer 2011 as ripe sloes gathered from two blackthorn bushes: one on the banks of the Ashton Canal, Ancoats and one by the River Sett between New Mills and Hayfield in the Peak District. The Ashton Canal winds its way from central Manchester to the market town of Ashton-under-Lyne, six miles to the east. It's a remarkable journey that takes walkers, cyclists, boats and geese past the boom and bust regeneration of inner-city Manchester (half rebuilt and reinvented as New Islington, half still rubble and spaces left by ruined mills and factories); alongside Manchester City Football Club's glittering stadium and the slightly less glamorous Eastlands retail park (highlight – ASDA); near the shabby Victorian elegance of Philips Park, Manchester's first public park, leading to reclaimed nature reserve Clayton Vale and the Medlock Valley; and next to Fairfield Moravian Settlement, an island of tranquil cobblestones and Georgian cottages surrounded by suburban Tameside with its canal-side sports pitches and pensioners playing waterside pétanque. We are lucky to have this urban oasis running through the city: the canal would have been closed in the 1960s if the local council had its way. When road transport became widespread, canals went out of fashion. They grew obsolete and expensive to maintain – and it took volunteers across the country long and laborious hours to restore Britain's canal network. These campaigners reimagined a new use for the inland waterways as sites of leisure and tourism – for boating holidays and afternoon walks – rather than toil – horses and boats still hauled coal and other goods along canals, including the Ashton, well into the twentieth century, the purpose for which they had been built centuries before. At Ashton-under-Lyne, the Ashton Canal hits the Portland Basin (home to the Wooden Canal Boat Society and Portland Basin Museum), where canal adventurers head south east onto the Peak Forest Canal to continue their journey through the Cheshire towns of Hyde and Marple and then on to New Mills (a place defined by its spectacular geography; the town rises up into the hills as the rivers Sett and Goyt descend into sunken Torrs below) and Whaley Bridge in Derbyshire, where the canal comes to an end. The second blackthorn bush was encountered along the Sett Valley Trail between New Mills and Hayfield on a rainy yet peaceful bank holiday weekend walk. Hayfield is a picturesque rural village overlooked by the Peak District National Park's highest point, Kinder Scout – a landmark visible back in the city, from Ancoats, where this story starts. In April 1932, Kinder was the scene of one of Britain's most famous protests. Several hundred ramblers from Manchester and the surrounding region, including folk singer Ewan MacColl, led a mass trespass up Kinder Scout to protest that what had previously been common land had been taken over by private interests. It's them we must thank for our rights to roam over Britain's countryside today, something we can take for granted: the ability to explore and reach out from the crowded cities around us, to wander at our leisure. 2012 will be the 80th anniversary of the Kinder Trespass. Find out more at http://kindertrespass.com or visit Salford's Working Class Movement Library, which holds material related to the protest. The Golden Age of Canals, an excellent BBC4 programme about the formation of the Inland Waterways, mass activism to save canals and their changing uses, will be repeated on Monday at 7pm.